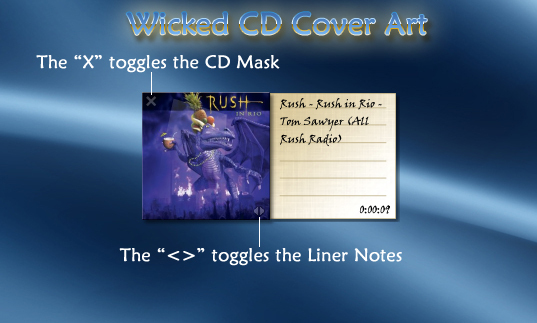 This is something I've been working on for a while...it's a Widget that pulls the CD Cover Art from the Internet. If you're listening to Streaming Media it will get the CD Single Art if it exists. I've confirmed it works well with Winamp...I'd be interested in knowing if it works with any other Media Players. Thanks Wicked. I've been waiting for this one. Very welll done! Very nice, but it doesn't work with iTunes. Cool. Doesn't work with WMP or foobar2000 FYI. Thanks everyone! Looks like its a WinAmp only thing for now. Oh, and for you IRC users...there's an undocumented feature that puts a "WickedP is listening to..." string in the clipboard everytime the song changes so you can annoy your fellow IRC channel mates. library, saving of the artwork to Itunes folders etc.). For some reason the font in the screen shot isn't the one it is using. Oh, and it will work with foobar2000 if you get the Winamp API emulator plugin. Using it with foobar right now. Edit: Perhaps what is even more interesting is the fact that it actually works better with foobar than Winamp, at least for me. That is to say, albums that Winamp didn't get the art for, or got the wrong art for, are getting the correct album art when played in foobar2000. Cool. There are objects out there that show iTunes cover art - I know I made them so you can use these. Yeah...the problem is most of the stations put the Artist and Song Title in the string...so with Streaming content most of the stations will only generate CD Single art. With local content it should alway get the Albun and Artist art...unless you changed the "Advanced Title" format in WinAmp. As for changing the font...you would need to import the Widget and right click the text and change the Font settings on the States tab. thanks for the info, wicked!